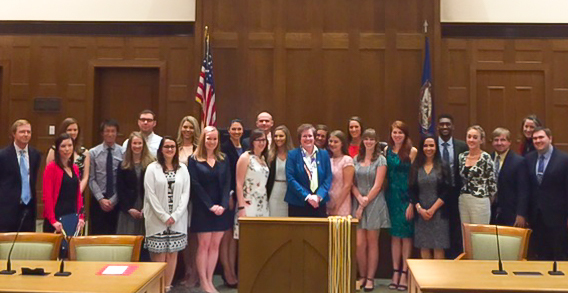 Congratulations to the graduating students of the University of Richmond School of Law who received the Harry L. Carrico Center for Pro Bono Service Pro Bono Certificate on Friday, May 5, 2017. The recipients are (pictured) M Vanessa Alvarez, Courtney Anderson, Sarah Barnett, Mallory Brennan, Cole Dadswell, Christopher Daniels, Christopher Doyle, Hunter Glenn, Jonathan Harrison II, Gabrielle Heim, Kasey Hoare, Daniel Hogan, Heidi Keiser, Jamison Kinnane, Andressa Marques, Blair Mathias, Danielle Mayfield, Lauren McGarry, Paul Michelle IV, Micaylee Noreen, Thomas O'Dea, Jonathon Packard, Lauren Ritter, Niccole Sandora, William Stroud, Biniam Tesfamariam, Alanna Trivelli, Marieke van Rijn, Rachel Willer and Jessica Wright. The Class of 2017 produced the largest number of certificate recipients to date, representing approximately 20% of the entire class and having donated more than 6,000 hours total of pro bono service. During the ceremony, Ben Pace of Williams Mullen spoke on the topic of “Pro Bono Service and the Legal Community.” Law School Dean Wendy Perdue and Carrico Center Director Tara Casey also addressed the recipients.